Nearly one month on since number two was born, I thought I’d update you all on how things are going. So far so good, I have to say its a lot easier having a toddler and a newborn than I thought it would be. Granted that might be down to the fact that my fiancé is on paternity leave from work, so we can have a child each to watch! My daughter was at first slightly jealous I think, but that’s to be expected. She has however quickly taken to her big sister role, and I can already see a bond forming between them, and it’s beautiful! She loves kisses him and always aims for his lips! 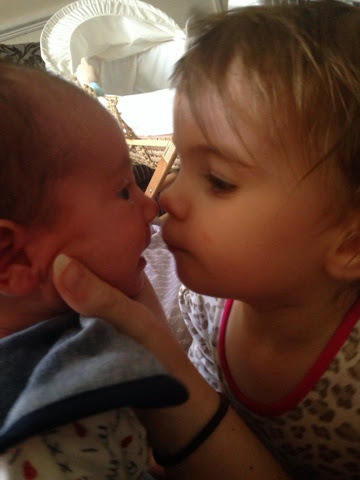 She likes to burp him (and is surprisingly good at getting his wind up), she also likes to go face to face with him for some reason and say his name repeatedly. I am not looking forward to my finance going back to work next week, as I willl be left on my own to look after my two babies, scary thought! I am hoping that no2 will be content to be left in his Moses basket while I put no1 down for a nap, and I hope no1 doesn’t get jealous when I am feeding no2… I guess only time will tell though. The most important advice I could pass on to anyone expecting their second child and especially with such a small age gap is to make sure that you include your eldest in the things that you do for and with your newborn, for example you can ask them to fetch a nappy from the drawer or to help put babies socks on etc. This helps them to feel that they are a part of the new arrivals life and that they are still very much needed and loved. Secondly, be patient! Your eldest may have some behavioural changes, for example being “naughty”, but more than likely this is just to get your extra attention as they may feel a little left out now that mummy and daddy’s attention is split between two children. Do you have any advice / tips that could help me and other parents on looking after two young children when your part ever returns to work? What a lovely little family. There is nearly 3 years between mine, and I was surprised at how well it went, until recently. Now Aaron is 8 months he is playing more, and crawling about and that seems to have produced an increase in jealousy. On the other hand they now laugh and play together and it is just wonderful to watch them bond! Glad every thing is going well for you. I'm hoping to have two under two too! so its nice to see how it is going for someone else! Lovely to hear that it is going so well. I'll keep my fingers crossed for you when your fiancé goes back to work.